Let me ask you a personal question. Where do you work? What is your profession? How many hours a day you spend sitting? Majority of us have desk jobs. Sometimes, this sounds great; we are not at risk of falling off the building or getting shot in a police intervention. On the other hand, we are in the huge risk of suffering the consequences of too much sitting. I have another set of questions to ask you. Prepare yourself, usually when someone asks you this you feel offended. What is your body weight? Are you satisfied with your body image? How many pounds would you like to lose? Or are you too skinny, without any muscle on your body? Oh yes, we are all beautiful in all of our shapes and sizes, but if there is a place and desire for improvement, why shouldn’t we do it? Especially if there is an inexpensive machine that could help us? No, this is not some scam, and I am not trying to sell you some magical belt or suspicious tea for the perfect figure. Yes, you will still have to work out and sweat to get the results, but you can do it while you are sitting and watching your TV show, or filling some boring forms on your work. Let me present you the best mini exercise bikes on the market, and then we’ll talk more. 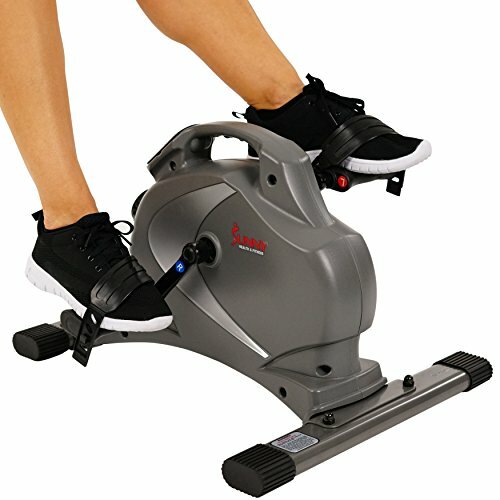 How to Choose the Best Mini Exercise Bike? Sunny Health and Fitness’s magnetic mini stationary bike might be a good idea if you want to stay in shape, do some cardio and improve your figure. 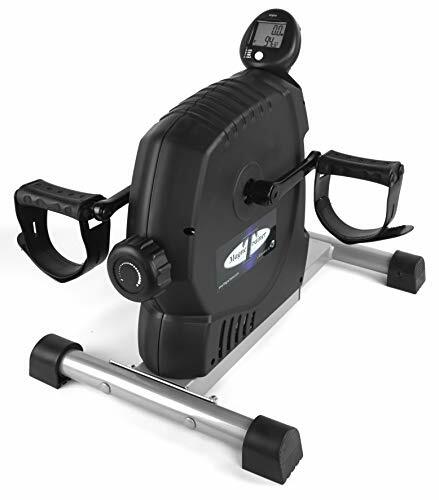 It comes with safety pedal straps, tension controller that offers eight different levels, LCD for tracking your progress and a one-year warranty. What I really liked about this bike is the fact that it is smooth and comfortable, so no more awkward breaks or pain in your knees. Also, it is extremely quiet so that you can use it in your office. Tension knob works better than expected and LCD is large enough for anyone to read their progress. On the other hand, if you use this machine for more than 15 minutes it will become squeaky. The left pedal is the biggest problem here, it becomes loose and wobbly after only a few uses, so you have to tighten it after every workout session. Also, be careful because it might move around while you are using it, especially if you place it on the carpet. Handle for moving it is practical. The tension knob works efficiently. It has a large, convenient display system. If you use it for more than 15 minutes, it becomes loud. Left pedal might become wobbly. It might move around while you are pedaling. If you cannot afford Sunny’s model, Fit Sit would be my second recommendation. For the money, you invest in this unit you will have a chance to choose the color you like and get a sturdy machine with cooling technology that prevents overheating and anchor strap to limit potential sliding during the use. LCD readout will display your exercise time, revolution count and number of calories burned. Blue, yellow, green, orange or fashionable pink – the choice is yours. Except for the beautiful design, this affordable mini exercise bike is foldable and easy to store away or take with yourself while traveling. Assembly is done within a few minutes, and the whole construction seems sturdy enough. However, this machine is too light, so it will move around, even if you are using anchor straps. This will happen even more when you increase the tension. If you have large feet, skip this product, because pedals are too small. Also, you might find its noise annoying. It’s easy to fold and store away. It seems to be sturdy and durable. It is very light, so it moves around. Pedals might be too small for you. It doesn’t fit under the desk. 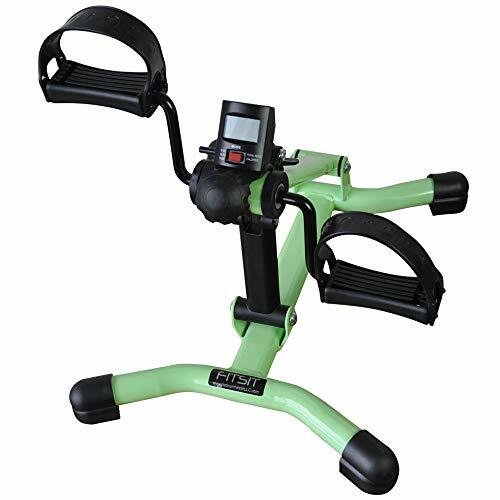 If you are shopping for a mini exercise bike on a tight budget, DMI’s pedal exerciser might be a right choice for you. If you decide to purchase this affordable piece of fitness equipment, it will tone your muscles and improve your circulation. Heavy duty steel tubing and slip resistant triangular tips are here to ensure durability and optimal workout experience. This unit is pretty straightforward when it comes to assembling and disassembling, which means you can easily pack it up and store it away. Don’t worry that you will “get what you pay for” because this device is truly durable and made of high-quality materials. Also, it is quiet, so it won’t bother you while watching TV or working. Be aware that it doesn’t come with an inbuilt computer like the rest of the mini bikes from this group, so you’ll have to watch for your progress on your own. Also, it loses resistance as you keep pedaling and it starts to heat up. Be careful, so you don’t get burned and don’t fall off because it will slide around your house. It’s easy to assemble and disassemble. Tension knob is easy to adjust. Doesn’t have an in-built pedometer. It heats up if you pedal too fast. It tends to slide around. Resistance decreases as you keep pedaling. If you ask me, investing a little more money in fitness equipment always pays off. 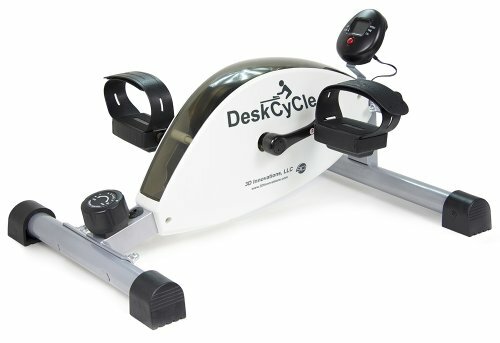 If you agree with me, DeskCycle might be just the thing you are looking for. You will spend few more bucks on it, but you will get a mini-bike that offers wide resistance range, online calorie calculator, desk display stand and bi-directional operation. It is tough to find a mini bike that is completely silent, and that won’t start losing resistance as time passes. Fortunately, DeskCycle is here. You can use it under your desk, and all you need for the assembly is one wrench, which comes with the bike. At last, you will get a full one-year warranty that will cover any potential failure. However, you’ll notice that number of calories resets once it reaches 1000. Also, your knees might hurt a little bit until you get used to the motion. This is not the best product for tall people, who have long legs because they will end up hitting their knees in their desk’s bottom. It offers a significant resistance. You can use it under your desk. It comes with a wrench necessary for assembly. You’ll get the full one-year warranty. Calories setting resets to 1 once you reach 1000. Your knees might hurt a little bit. Tall people might have a problem using it under a desk. MagneTrainer has something new to offer. It is adjustable. If your feet are simply too big for any pedals you try, this piece of equipment should be your choice. 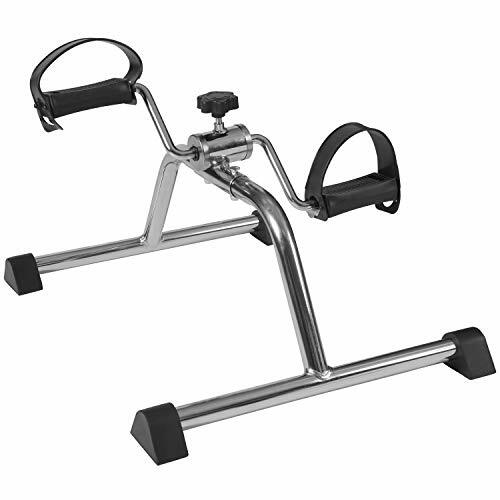 To be honest, it is a bit expensive, but you will get commercial grade arm and leg exerciser, with steel frame, magnetic resistance and an electronic monitor that shows speed, distance, time and calories. The biggest advantage of this device is that it comes with adjustable Velcro straps on the paddles to fit all feet sizes. Also, another Velcro strap will be provided to prevent sliding. This mini exercise bike is ideal for rehabilitation purposes, and you can use it sitting in any chair you want. However, without a strap to stop sliding, it will slide all over the place, no matter the surface underneath it. It might be a little heavier and bulkier than you would expect, so storing it won’t be that simple. After a few months, you might notice paint wearing off. It’s adjustable to fit all foot sizes. It comes with a Velcro strap to prevent sliding. You can use it sitting in any chair. It is ideal for physiotherapy. The tension adjustment is superb. You will spend a lot of money on it. Without the Velcro strap, it will slide not matter the type of surface. The paint might start wearing off. There are three main areas in which exercising on a mini bike can bring a significant improvement: weight loss, muscle tone, and injury rehabilitation. When it comes to toning your muscles, the mini bike will have the biggest impact on your legs. Calves, quadriceps, hamstrings and hip flexors should show improved definition and tone after a few months of regular use. It is also possible to use this machine for toning stomach muscles but to do this; you’ll have to place it further away from the body and change the chair position to get some incline. If you plan on using a mini exercise bike for physical therapy, you should always consult with your doctor and get a proper program for the best results first. It will help you by promoting your circulation, strengthening your muscles, limbs, and joints after any injury or for recovery after surgery. Read more : How to Run after Leg Day and Even Feel Great About It! Mini exercise bikes are often lightweight and compact, which means as soon as you increase the tension they start to slip under your weight. This makes maintaining the right balance if you are standing, and keeping your feet on the pedals if you are sitting - almost impossible. Make sure to choose a model that has a sturdy steel construction and non-slippery base or some other sort of sliding prevention – as Velcro tapes for example. However, if you already made a mistake of buying a slippery device, spend a few bucks on a rubber mat and place it underneath the bike. This will save you from potential injuries. People’s motivation can be a simple thing – it works the best if you see the results. Still, there is no way that you will see the results of your workout after only a few sessions, which is why it is important to have a progress monitor. Many models come with a small LCD screen that will show you distance, speed, calories burned, how long you've worked out and other useful metrics. This should help you reach your goals and keep track of your progress. But, if you buy a cheap model you shouldn’t rely too much on those numbers, especially on the calorie count. It is more of a rough estimate than exact measure. After a few workouts, you’ll need to level up your game, or you will get bored, and you won’t make any progress. This can be done by increasing the resistance which will affect the intensity of your workout. Many people like to use their mini exercise bikes while watching TV, working or reading a book. Workers who spend eight and more hours sitting in a chair without having much time to hit the gym are particularly fond of this option. That is why you’ll need a quiet or if possible silent machine. Unfortunately, mini bikes, just as mini steppers and other similar pieces of fitness equipment are famous for their noise and squeakiness. So, make sure to read the reviews or try a bike on your own and be certain that it doesn’t make any unpleasant sound while you workout. If you plan on transporting your bike from your home to your office or simply move it around the house, there are two features that it should have – carrying handles and being foldable. This will make a job much easier for you and storing or transport wouldn’t be an issue. The choice might not be that obvious because there are many great machines in this group, but I decided to go with Sunny Health & Fitness Magnetic Mini Exercise Bike. Someone might say it is nothing special, but that someone doesn’t know what he’s talking about. This mini bike has all of the characteristics I wrote about in the previous section. It is quiet, the tension is adjustable, it tracks your progress, and it has a practical handle. Just make sure that you assemble it correctly so you wouldn’t have a problem with the left pedal. Whichever bike you chose, you won’t make a mistake, and even if you do, I already told you that one rubber mat could fix one of the biggest problems mini bikes usually come with. A little oil or silicone to lubricate the squeaking parts can sometimes serve as a quick solution too. Make sure to stay on your work out schedule, don’t skip a day, and you will be surprised with your body and health improvements.